Before you vote in a national election, you should ask yourself: Where Does the Money Go? The acclaimed and essential work by Scott Biddle and Jean Johnson has been updated to reflect the recent financial crisis and the sweeping legislation passed by the Obama administration in its first years. Nonpartisan and well-balanced, Where Does the Money Go? 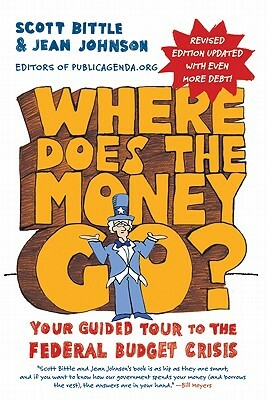 is a candid, eye-opening, and delightfully irreverent guide to the ongoing federal budget crisis that breaks-down into plain English exactly what the Fat Cats in Washington, D.C. are arguing about. Scott Bittle is an award-winning journalist, policy analyst, and web producer who has written extensively about the federal budget, energy, and foreign policy. Jean Johnson writes frequently about public opinion and public policy and is the author of You Can’t Do It Alone, a book on how parents, teachers, and students see education issues. Both authors are senior fellows at Public Agenda and blog frequently for the Huffington Post, National Geographic, and other outlets.